Ruffner Mountain Nature Preserve in Birmingham offers a nice set of day hikes along Red Mountain. The limestone quarry is a great hike. Starting at the visitors’ center, hikers begin adjacent to the bird habitats and make their way along the path to the trailhead. Taking the Quarry trail (white), you will ascend a small incline to the ridge and then follow along the ridge of the mountain a little over three-quarter of a mile. Along the path are a variety of tree and plant species. During the spring months, much of this foliage is in bloom and offers a great array of photos opportunities. As along the path are mine depressions left from the digging or collapsed underground mines. The path along this course is mostly level and dirt with few rocks. 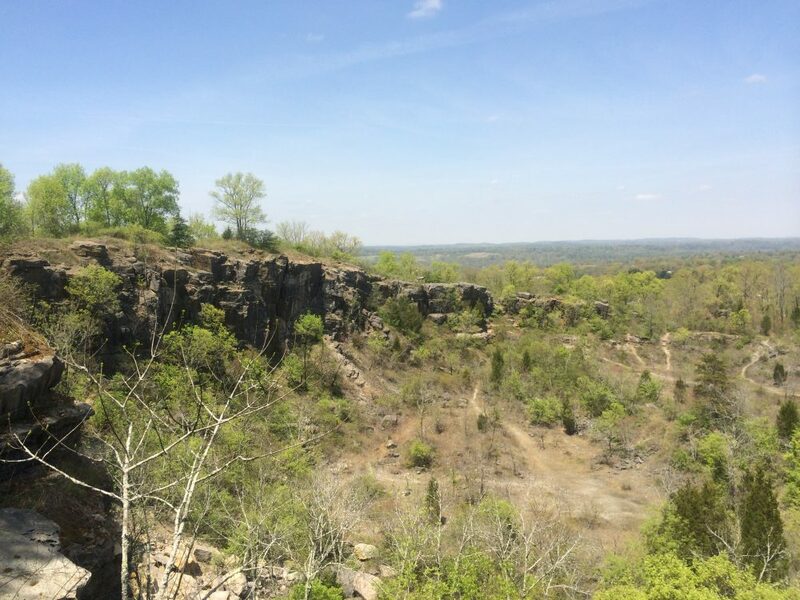 The quarry trail also acts a connector to other trails at Ruffner Mountain. Some of these include Buckeye, Ridge and Valley, Crusher, and Silent Journey trails to name a few. Trails are well marked with wooden sign post along the hike. You will then turn downhill past several more mine impressions before reaching the quarry. Wanting a good view of the quarry, rock wall faces, and downtown Birmingham, we took the red Hollow Tree trail (red) up and along the ridge of the quarry. This offers a great view and perspective to the amount of strip mining that occurred at the site. Cambrain Overlook is a great stopping point to the take in the view of the quarry and surrounding mountains. At the end of the trail, hikers have a great view year round of downtown Birmingham in the distance. Hiking back down the trail, we continued on the Possum Loop trail (yellow) into the mouth of the quarry. Within the wall, you gain a better appreciation to the depth of the quarry and can view several fossils impressions in the rock. Though the Possum Loop is a good trail, during the summer months it can become overgrown with vegetation. We decided to turn back towards the visitor center. Instead of taking the quarry trail, hikers can also use the Silent Journey trail (green). This trail is moderately hard when trekking towards the visitor center. The path is rocky and ascends the hillside quickly. The tree and plants along the path again offer a variety of photos. To finish off the hike, we stopped on the way back at the Winter Overlook. A short 250 feet off the trail, hikers can take in a panoramic view of the airport and surrounding area. During the summer months, though, this view is limited by the thick vegetation. Returning to the visitor center we followed the Quarry trail. Overall, this is a great hike with plenty to see. It’s a good day hike and being centrally located in Birmingham is easily accessible. From Interstate I-59, North or South bound, take Exit #132 at First Avenue North. At the end of the exit ramp, bear to the right onto 1st Ave. Go to the first traffic light at 83rd Street and take a right. Turn right on 4th Ave South. Turn left at 81st Street South. Ruffner is located at the top of the hill at the end of the street.